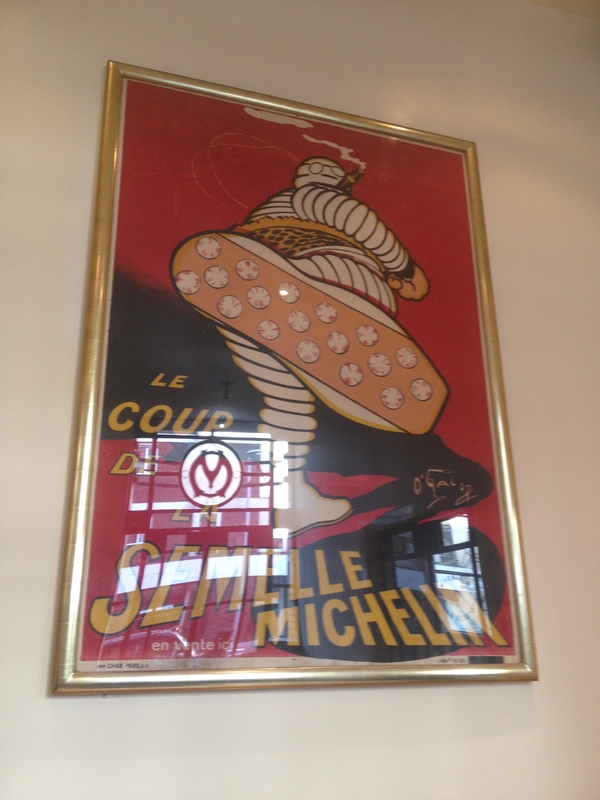 Bibendum, commonly referred to as the Michelin Man, is the symbol of the Michelin tire company. He is one of the world’s oldest trademarks. The slogan “Nunc est bibendum” (Now is the time to drink) is taken from Horace’s Odes – and that’s pretty old. 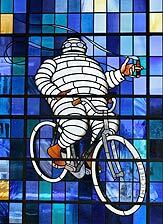 The Bibendum Restaurant is situated in South Kensington, London and is actually in the old Michelin tire factory known as Michelin House. 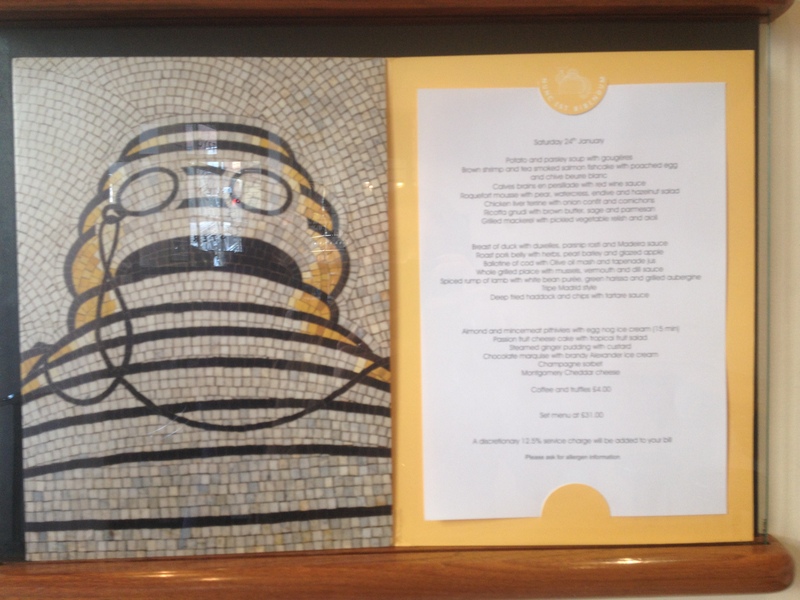 It’s beautiful, iconic building spans over three floors, includes an oyster bar, a cafe, the restaurant and is decorated all over with Bibendum memorabilia. When I say it was decorated all over – I mean all over! Bibendum’s face was everywhere and it was so cool to see all the old Bibendum themed posters and the iconic stain glass windows! Here he is sat on the butter dish and monogrammed on my dish! I was lucky enough to be treated to lunch in the Restaurant with Josh and his parents recently and the food was so good! 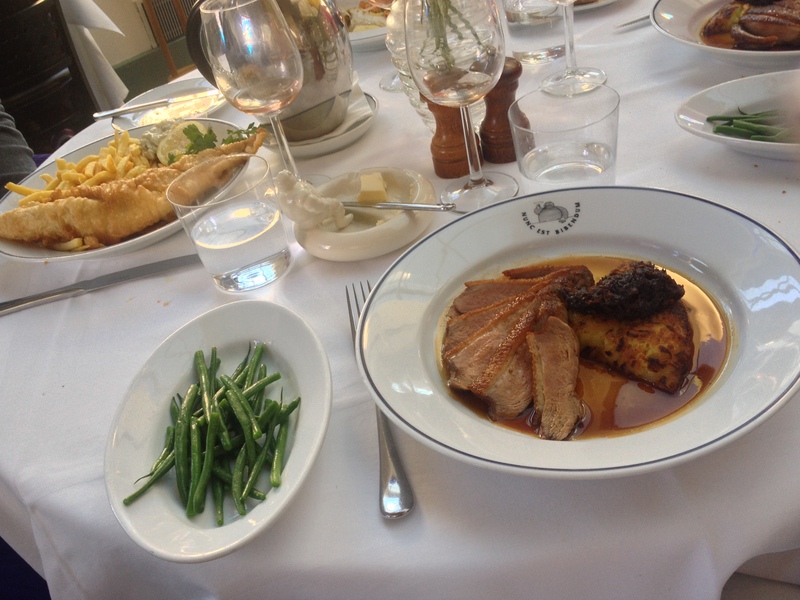 The food is described as “Classic french food with a strong British influence”. 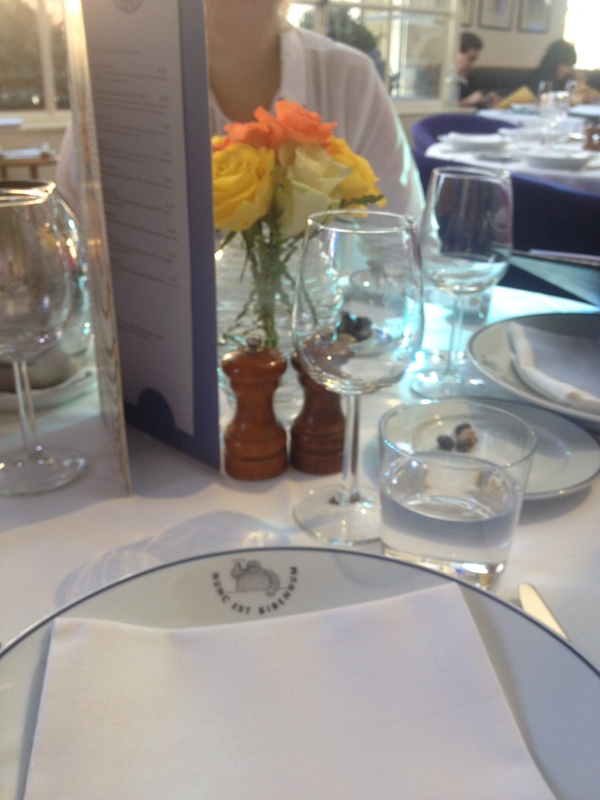 We had a great time – the staff were really helpful and the food was delicious! For starters I chose Ricotta Gnudi. I had never had it before and I wasn’t really sure what it was at the time! On the menu it was described at “Ricotta Gnudi with brown butter, sage and Parmesan”. It was so tasty but quite filling. The ricotta was really soft with a delicate shell around the outside. 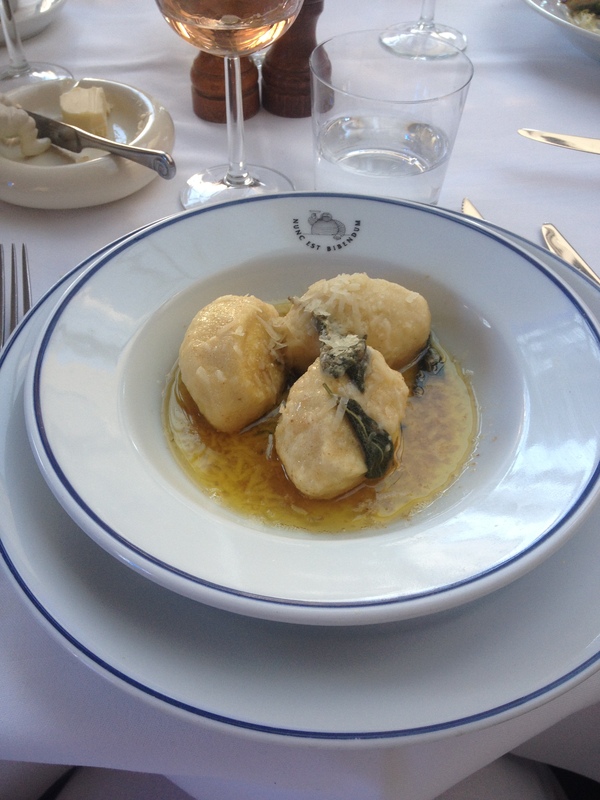 These pillow-y balls of cheese were served with a rich butter sauce and crispy sage leaves – it was so good I might even try and make it myself at some point – although I’m sure I won’t be able to do them as well as this! Also pictures are the “Grilled mackerel with pickled vegetable relish and aioli” (right) as well as the “Brown shrimp and tea smoked salmon fishcake with poached egg and chive beurre blanc” (centre). 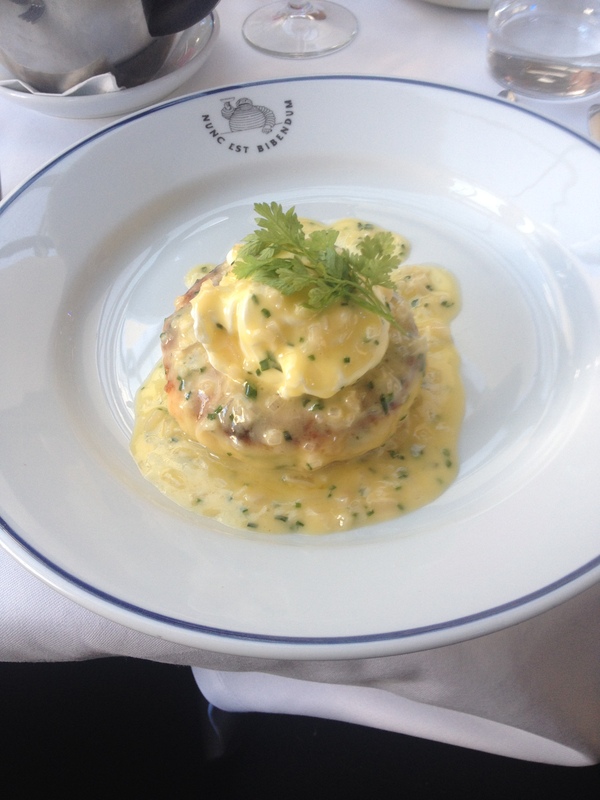 Josh really enjoyed the Salmon Fishcake and he loved the runny middle of the poached egg. The main dishes were so beautiful! Everything was pristine and the food was delicious and still piping hot. 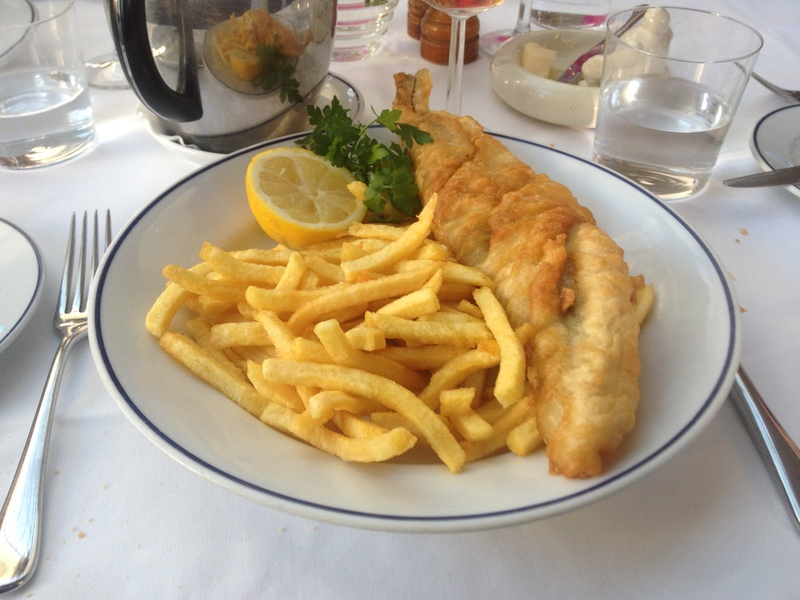 Josh ordered the “deep fried haddock and chips with tartar sauce” – which I thought was risky – it wasn’t that long ago that we had Haddock and Chips in Edinburgh and that was so good! 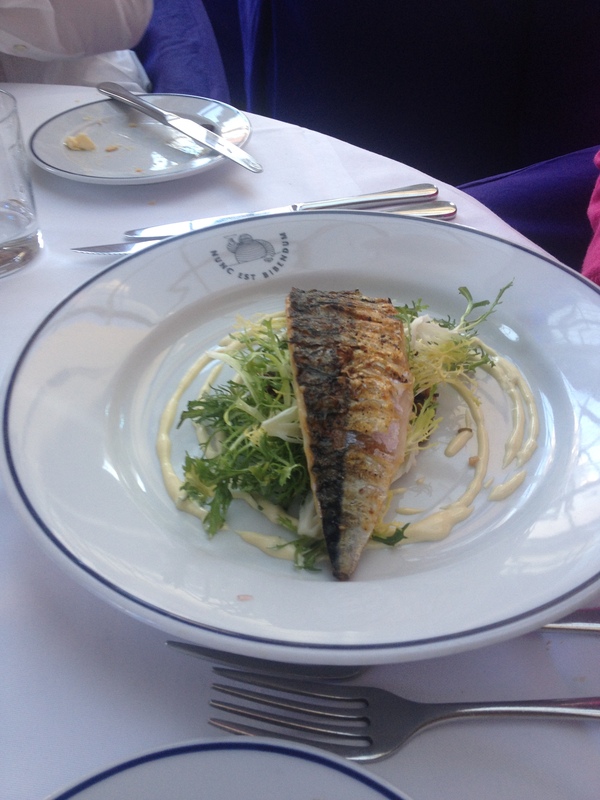 Josh was not disappointed though – the whale fish was massive and really fresh! The chips were really nice and not greasy at all. 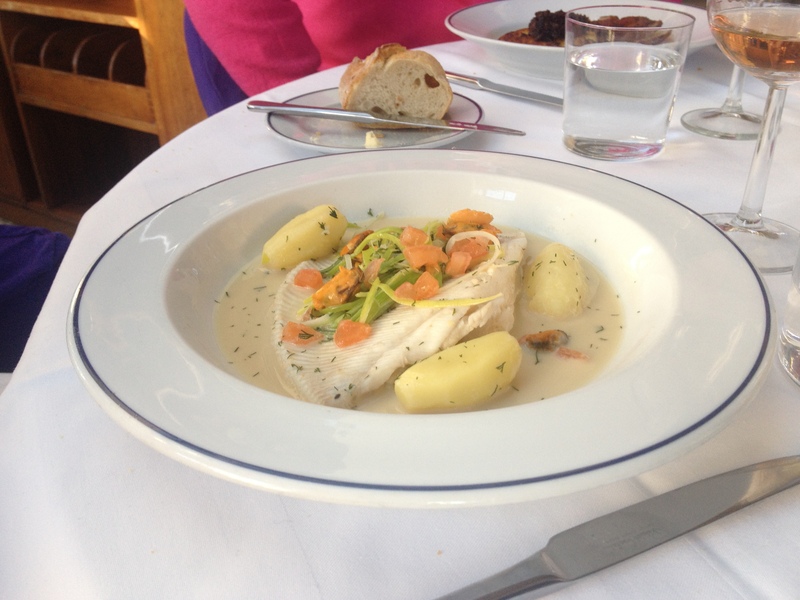 On the right it Josh’s mum’s choice of “whole grilled plaice with muscles, vermouth and dill sauce” – she really enjoyed it too – everything we had was delicious! Josh’s Dad and I decided to go for something a little different and chose “breast of duck with duxelles, parsnip rosti and Madeira sauce”. It was gorgeous and still a little bit pink in the middle, served with fresh green beans – yum! 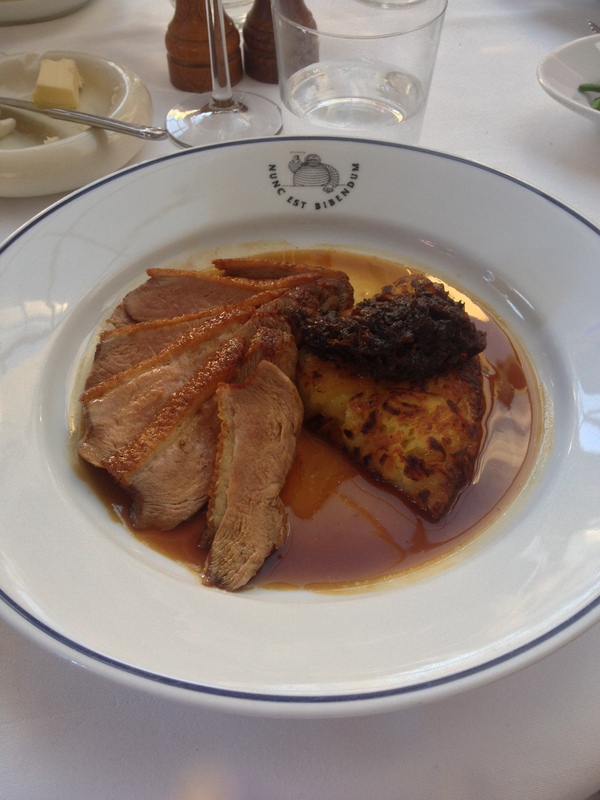 Duck and Madeira Sauce was a really good combination – we really enjoyed it! 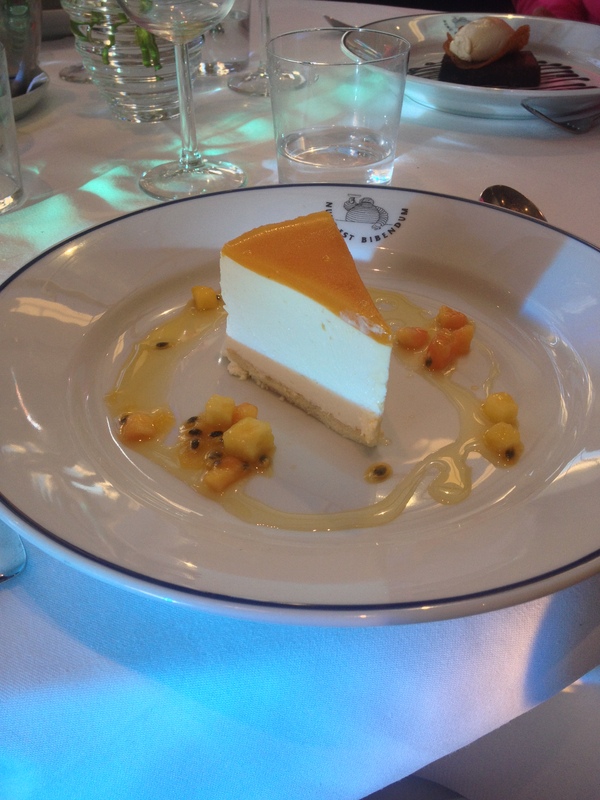 For dessert Josh and I chose the “Passionfruit Cheesecake with tropical fruit salad” which was deliciously sweet (and reminded me of days spent at the beach with passionfruit flavoured ice lollies!) 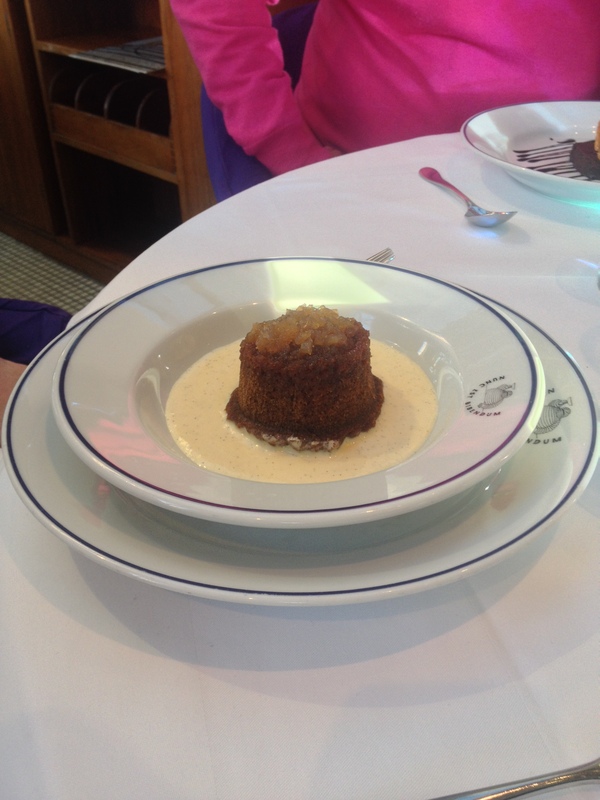 while Josh’s mum went for “Steamed Ginger Pudding with Custard” – she loves custard. She really enjoyed this pudding and even offered me a taste – it was really nice, not too sweet but was like all good homemade steamed pudding should be – stodgey and gooey! 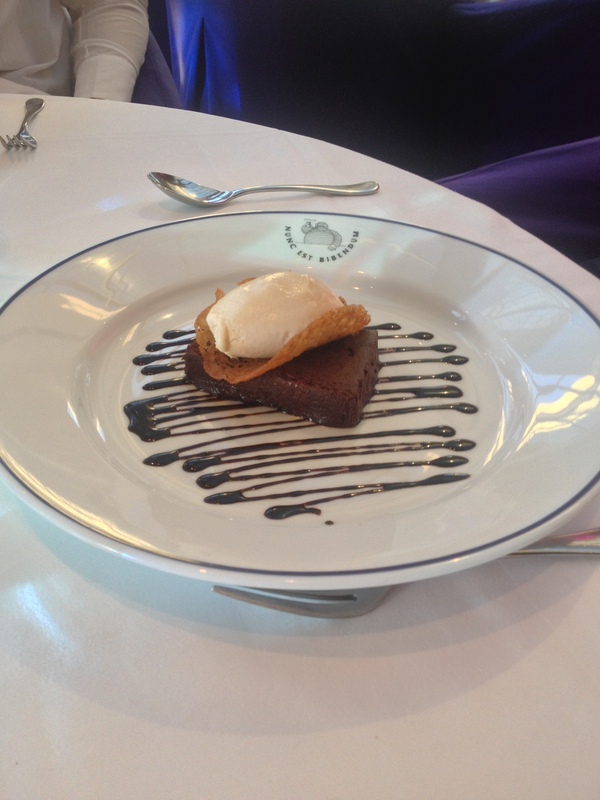 Josh’s dad chose “chocolate marquise with brandy Alexander ice cream”. Now I’m still none the wiser about what a marquise is but all I can tell you is that it is a seriously chocolatey dessert and looked delicious! 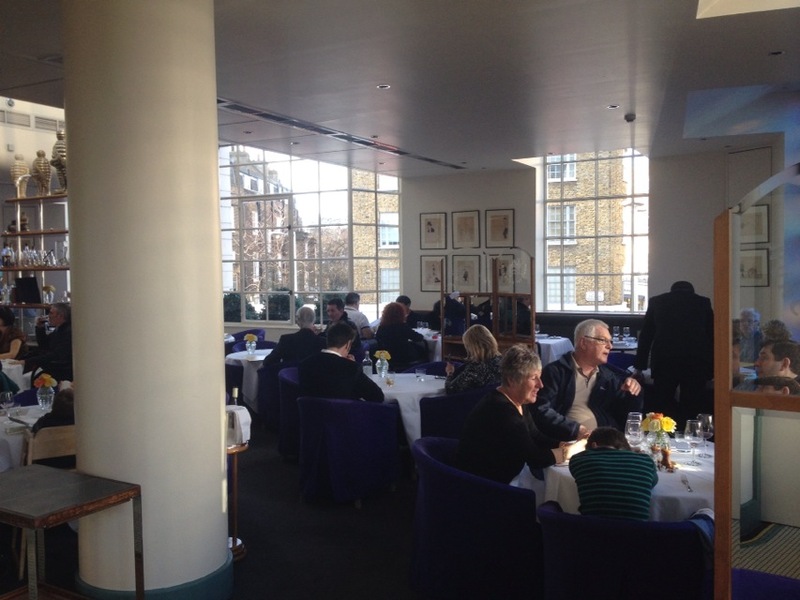 We had a brilliant time at Bibendums, the atmosphere was really nice, the food was amazing and it was really great to see Josh’s parents as we hadn’t seen them since the wedding! We had a good catch up but then we were pretty tired after our day out in London. After lunch we went for a little bit of a wander around some shops – but then went and caught our train home. ← How Not to Handle Criticism and Positive Thinking.